SAN JOSE, CA--(Marketwire - Feb 26, 2013) - Nimble Storage, the leading provider of flash-optimized hybrid storage solutions, today announced a reference storage design to complement VMware® Horizon View™ 5.2 for midsized VDI deployments. Nimble Storage SmartStack™ for VDI with VMware is a VDI reference architecture for midsized and enterprise deployments. The pre-validated solution is delivered by a network of joint channel partners leveraging the easy-to-deploy and sell reference architecture. The fully validated and tested reference architecture eliminates the complexities of configuring compute, networking and storage. "IT departments may not have the expertise to integrate separate best-of-breed solutions for VDI," said Mason Uyeda, director of technical marketing, End-User Computing, VMware. "Nimble SmartStack for VDI with VMware Horizon View 5.2 offers our mutual customers and channel partners a simple, cost-effective solution for hundreds of VDI users that is easy to deploy and scales as organizational needs grow." "We are committed to providing real ROI to our end users through our value-added reseller community," said Mike Munoz, vice president of sales at Nimble Storage. "To help our channel partners deliver real business benefits, we are happy to support VMware Horizon View 5.2 and will be announcing new go-to-market programs and incentives for SmartStack for VDI at VMware's Partner Exchange." "Together Cisco, Nimble and VMware have made VDI easy to manage and very cost-effective," said Suzette Allaire, CIO, Lindquest & Vennum. "We can now scale our VMware View environment at a moment's notice -- adding a block of new users in a lot less time that it took us with our previous solution. This has given us the ability to better serve our customers inside the organization and embark more quickly on new projects." Nimble Storage believes enterprises should not have to compromise on performance, capacity, ease of use, or price. Nimble has developed the first hybrid storage architecture engineered from the ground up to seamlessly integrate flash and high-capacity drives. Our customers enjoy as much as 10 times faster application performance, enhanced backup and disaster recovery, and stress-free operations--all while lowering their TCO. Nimble Storage solutions are available through a global network of world-class channel partners. 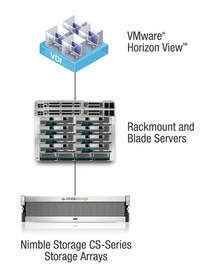 For more information, visit www.nimblestorage.com and follow us on Twitter: @nimblestorage. ©Nimble Storage and CASL are trademarks or registered trademarks of Nimble Storage. Other trade names or words used in this document are the properties of their respective owners. VMware and VMware Horizon View are registered trademarks and/or trademarks of VMware, Inc. in the United States and/or other jurisdictions. The use of the word "partner" or "partnership" does not imply a legal partnership relationship between VMware and any other company.